Day 1 of the 2016 Oceania Youth Cup tournament has again fired up with a round robin Lightning Carnival. The 4 nations able to attend this year have warmed up for the week ahead. The following report is courtesy of Ben Drew - AFL South Pacific Development Manager. It certainly was a fantastic day of footy with Nauru hanging on to again take the Lightning Carnival in 2016. All 4 teams were terrific in their matches and already you can see the improvement from 9am this morning to now. Teams played each other once in a round robin fixture playing 2 x halves. The Nauru Stars started well with a tough win over a physical Tonga Thunder side, Fiji Jnr Tribe were too strong for the Solomon Islands Sharks who are back for the first time since 2012! Round 2 saw a wonderful game between Tonga & Solomon Islands with the Tongan team just kicking 2 goals very late to take a win. The Solomon Islands boys had some lightening passages transitioning the ball from Defence to attack with speed, they just failed to take their chances. It was a great game! 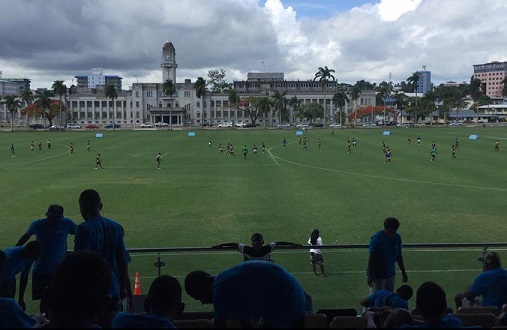 Fiji & Nauru played a nail biter which came down to Nauru being Smart with the ball and playing tempo footy against the breeze to hold on for a win. The next game saw a tired Fiji playing a fresh Tonga team! Tonga took it right up to Fiji and nearly took the points. Fiji had a shot after the siren to win, managed a point and scores finished level. A fitting end! The day was spectacular with an amazing facility at Albert Park, great Support from the Fiji Sports Commission and Coke came down with plenty of Powerade for the players! Great start to the carnival and we are looking forward to more great footy over the next 4 days! What happened to the Vanuatu Volcanoes? Not sure - haven't asked Ben that yet (had Telstra drop outs all afternoon at work so amazed I got as much done today as got done!!). Certainly I thought they would be there - were in the schedule, in the 'Record' etc. Haven't seen any mention yet.